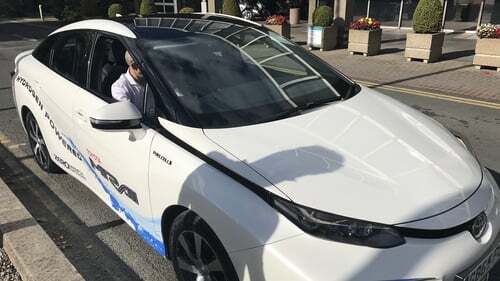 A mass-produced hydrogen-powered car has driven on Irish roads for the first time. The vehicle, produced by Toyota, is powered by a hydrogen fuel cell. It combines hydrogen and oxygen to produce electricity, the only by-product being pure water making it far more environmentally friendly than petrol or diesel powered combustion engines. Costing the equivalent of around €80,000 the Mirai has a range of 400km and can be refuelled in just three minutes at a hydrogen refuelling station. However, it is not and will not be available to buy in the Irish market, because the complete absence of such infrastructure here means it would not be feasible to use one. Instead, Toyota says it has temporarily brought the vehicle over from the UK to Ireland to prove such technology does exist and to stimulate a discussion about building a hydrogen refuelling network. The Department of Transport scotched any hope of that happening in the near future though. "There are no immediate plans to establish a hydrogen refuelling network," it said in a statement. "Hydrogen is not expected to deliver mass-market uptake before 2030 as the costs of the refuelling infrastructure and associated vehicles are likely to remain prohibitive until the middle of the next decade. "Consequently, the cost of the infrastructure, is greatly disproportionate to current demand. "However, the feasibility of establishing a hydrogen refuelling network will be regularly assessed to take account of changes in technological development and market uptake." Launched in 2015, the car can be purchased in the US, UK, Germany, Denmark, Belgium, the Netherlands, Sweden and Norway because their infrastructure is more advanced. Toyota is currently selling around 3,000 Mirai vehicles a year, but predicts this will have risen to 30,000 by 2020. A number of other large companies are also working on developing cost-effective hydrogen fuel cell powered vehicles, including Honda and Hyundai. Earlier this year Toyota opened up 5,600 patents related to it, to encourage others to enter the market. The Mirai carries up to 5kg of hydrogen at five bar pressure and the manufacturer insists it is perfectly safe. The fuel tank is made from a three layer carbon fibre polymer and has undergone extensive testing, including crushing and having a shot fired at it. Although the cost of the car is high, Toyota estimates that its next generation of fuel cell will lead to the price tag falling by half. There is no proper market for the hydrogen itself, but the company says it currently costs up to €10 a litre to buy. Refuelling stations are the biggest cost, however, with a price tag of up to €2 million. Another challenge is finding sustainable ways of making hydrogen. It can be made from fossil based resources, but scientists and engineers, including a team at DCU led by Dr James Carton, are working hard to find ways of making it from green resources. This might involve hydrogen being produced using renewable energy, like wind turbines, for example. Dr Carton says in some ways it was to Ireland's benefit that it waited until other countries had set up hydrogen fuel networks, to learn from their mistakes. But he says now we should be considering building our own. "Ireland really has to catch up on that to introduce this opportunity and option for drivers," he said.